Kooky-actress-it's-ok-to-worship Zooey Deschanel has apparently been cast as Ada Lovelace in a new film chronicling her life, Enchantress of Numbers. 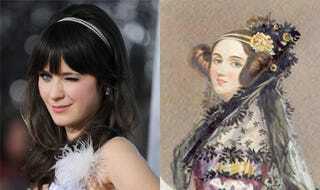 Lovelace, who died in 1852, was an English woman who wrote the first algorithm ever processed by a machine. Almost 150 years after her death, and she's the figurehead for an annual celebration (March 24th) of women working in the technology and science industries. The story goes that Lovelace, whose father was Lord Byron, translated an Italian mathematician's memoir about Charles Babbage's (an English mathematician/inventor) Analytical Engine, which was an early computer that never quite got built. Not only did she translate the story of the machine, but she also included her own notes—which contained a form of computer program, which would supposedly have been processed fine by the Analytical Engine, had it ever been built.